The drive up the slow and beautiful road to Cloudland Farm reflects the evening on which you’re about to embark – relaxed and tranquil. 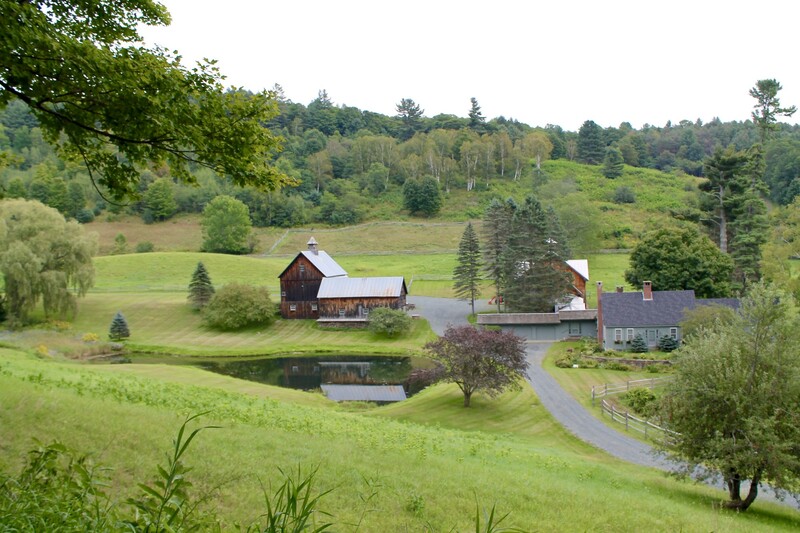 Past the likes of Billings Farm and the Golden Cow Barn lies the ascending course to Cloudland. Look as you drive by Joe Perry’s old home, equipped with personal recording studio and guitar-shaped pond. Keep an eye out for AT through-hikers crossing the dirt road. Exhale and breathe in the farm fresh air. Farm horses Pal and Cassie will be waiting to greet you as you park the car in the restaurant’s barn. You have now entered the world of authentic farm-to-table dining. About 15 minutes from Woodstock Village, the Emmons family has owned Cloudland Farm since 1908. The farm extends over 1000 acres with a portion of the Appalachian Trail down the hill, from which Cloudland’s on-site store receives a number of AT hikers throughout the summer. 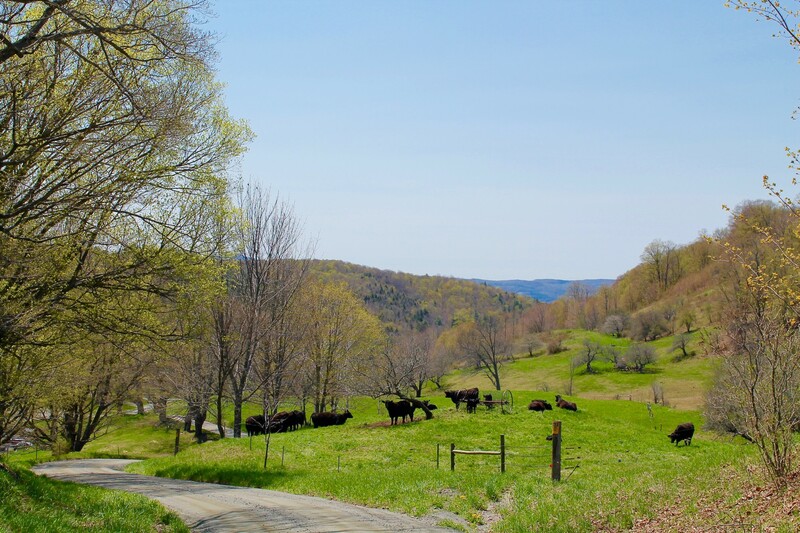 The Emmons have transitioned this once dairy farm, and now raise Angus cows, Berkshire pigs, turkeys, and chickens. 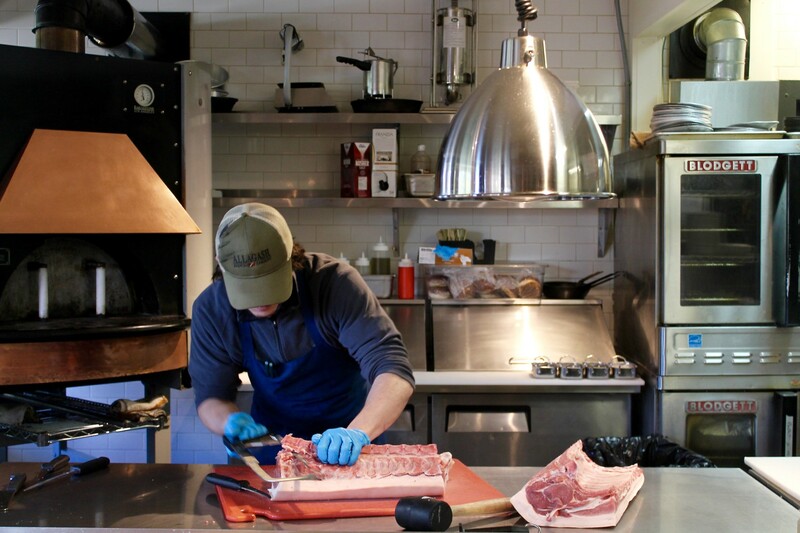 Cloudland not only uses this meat in their own kitchen, but also sells to local restaurants and the Woodstock Elementary School. Owners Bill and Cathy Emmons exude genuine kindness, as they operate a destination for the community – a special place to share in the abundance of the farm. Bill is undoubtedly proud of the property, so evidenced by the permanent smile he adorns while driving us to the pig and cow pastures for feeding. Early mornings spent tending the farm remain a thing of enjoyment for the Emmons, and we absolutely love sharing in this gratification and passion. 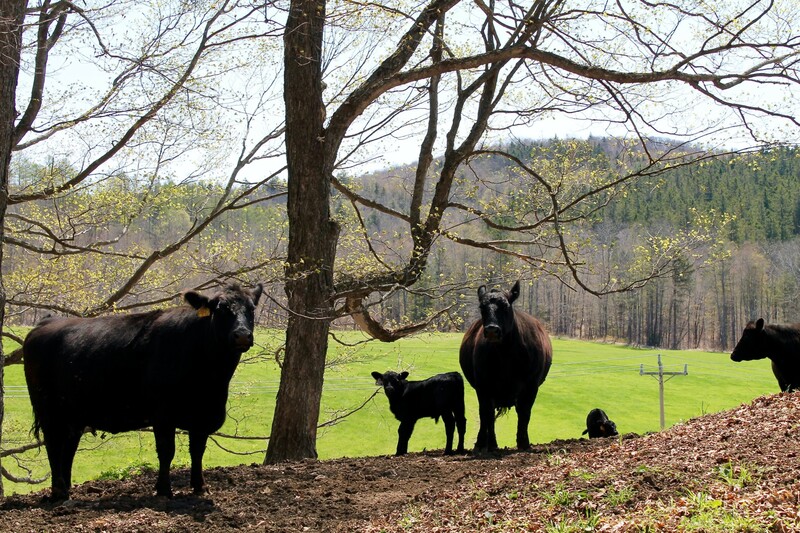 Cloudland Farm’s restaurant has become an ideal way to share the Emmons’ devotion to organic and sustainable farming. Cloudland’s restaurant has been in operation for five years, the ever-changing menu of which highlights dishes all made from scratch. 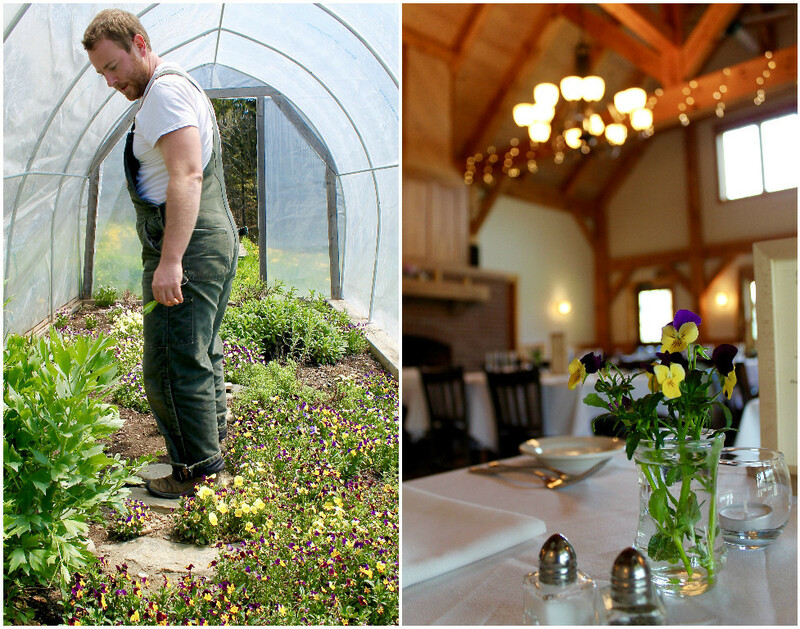 Our good friend, Head Chef Ira White, takes from the farm’s herb and produce gardens for his seasonal menus. Anything not found on the farm is bought locally. These farms are individually named on the back of each night’s menu. Cloudland’s restaurant is also BYO. You may enjoy a cold brew or bottle of wine on the porch and throughout your meal for a small corkage fee. 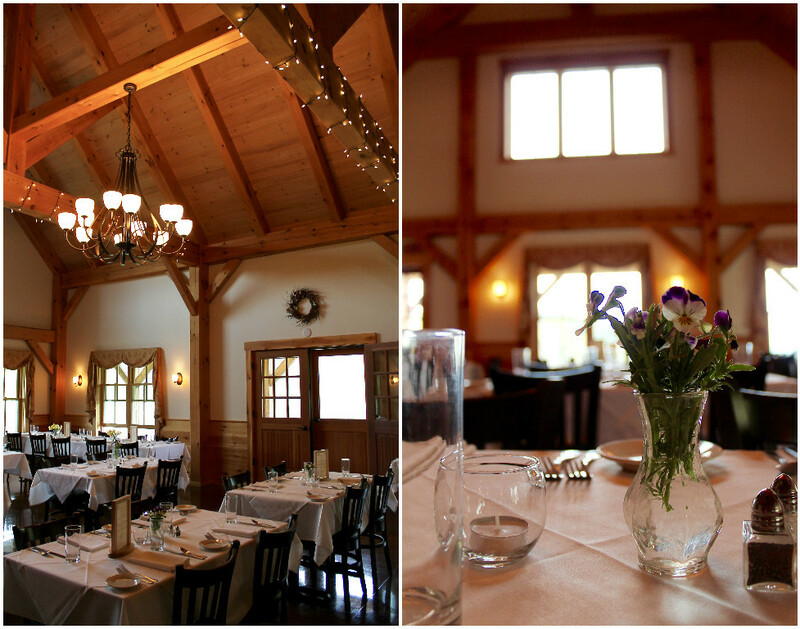 Without a doubt, Cloudland Farm is the first restaurant we recommend to those looking for a nearby farm-to-table meal. The restaurant’s team, including Chef Ira, goes above and beyond in its efforts to ensure guests have a special dining experience on the farm. From attentive service to delightfully tasteful courses, we feel confident each time a friend or guest secures a reservation. Beyond service, the truly authentic nature of Ira’s culinary efforts elevate the farm-to-table movement, attracting visitors and locals alike. Chef Ira walks us around the farm earlier in the week as he prepares the weekend’s menu. 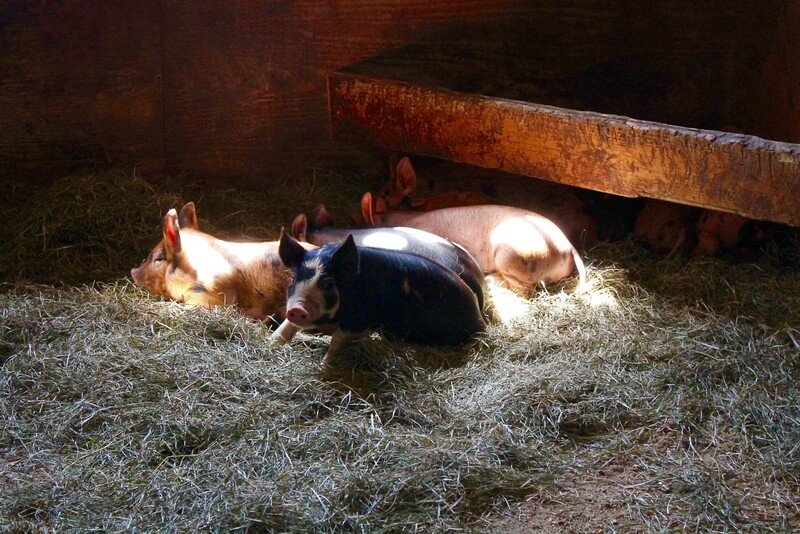 We coo as three-week-old piglets take a siesta in the barn, protected by the likes of a large mother pig. Just outside awaits a brood of chickens scurrying about. “We still have three calves to be born,” Cathy mentions. Bill and Cathy have been hard at work, as seen by the multiple calves moseying amongst the mature members of the herd. 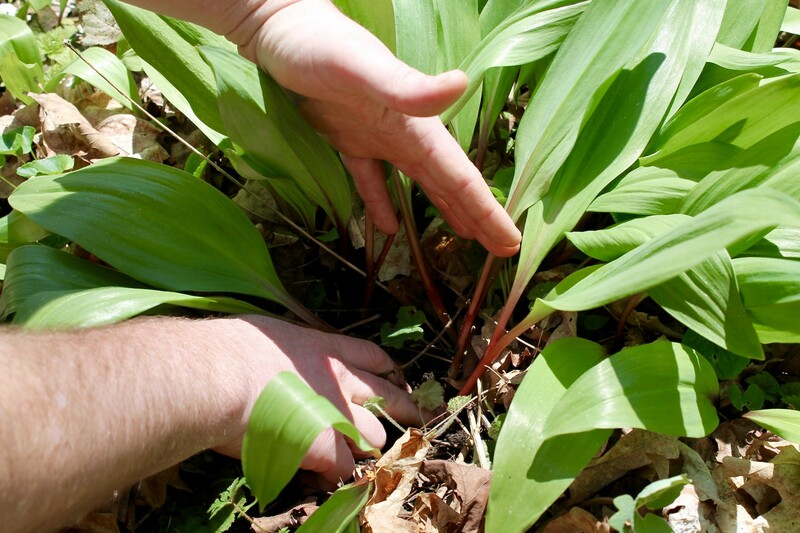 Ira continues to lead us into the forested hillside next to the pasture, where ramps grow abundant and wild. We begin foraging in anticipation of this weekend’s grilled ramp mashed potatoes, as well as the ramp butter Ira will keep through the winter. “Leave a few per clump so they grow back,” he instructs. This respectful foraging reflects the sustainable notion Cloudland’s chefs and owners allow to thrive on the farm. We travel toward the herb garden just behind the restaurant’s kitchen, where thyme, sage, tarragon, chives, and edible violas reside, readily available for Ira’s taking. “Rotating ingredients with the seasons excites me most.” This seasonality satisfies Ira’s innate sense of curiosity. Equipped with a fine arts degree in printmaking, Chef Ira believes this is “the most artistic job he’s had since being an art student.” Transitioning into the culinary world, his strong attention to detail has not only led to his in-depth research, but also his sincere relationships with producers. The world of microgreens, pickling, and nose-to-tail dining has fostered his meaningful collaborations within the culinary and farming community of Vermont. As such, Ira has come to experiment with ways to preserve and work with seasonal produce, as well as utilize all parts of an animal. 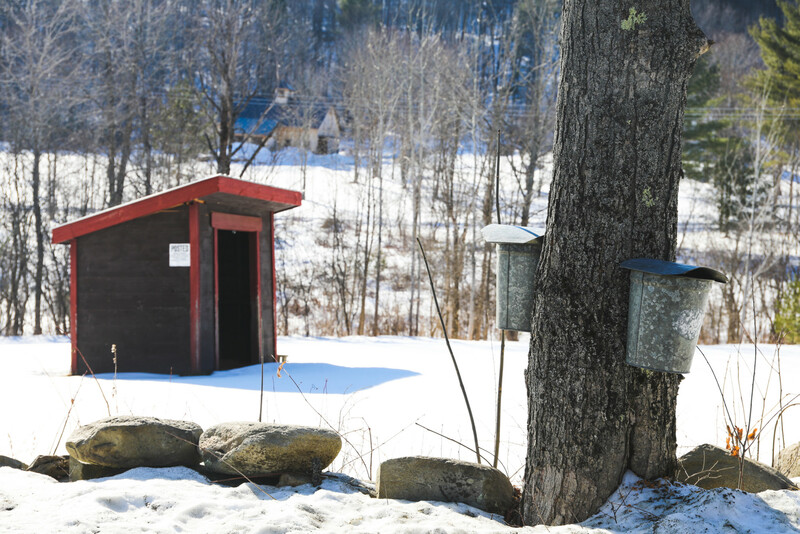 The art of teaching and learning has been most prominent within Cloudland Farm’s own kitchen. Previous chefs, such as Nick Mahood, played a major role in Ira’s restaurant education. And the teachings continue as the second NECI intern steps into the kitchen. Current intern Cleopatra’s classic training jibes with the experience and curiosity Ira brings to the table, allowing the two to bounce ideas off each other in creating an exciting menu. Prior to dinner, we sit on the restaurant’s wraparound porch, overlooking the scene that so clearly gives the farm its name. Beyond the back field and distant tree line lies layers of clouds and mountains. Atop the hill, you truly feel as if you sit amongst the clouds, conveying a scene that can only be described as quintessential Vermont. Fellow diners rest on the porch’s white adirondack and wicker chairs as they sip on drinks prior to their reservation. Guests are also welcome to meander around the pastures and herb garden – the sights of which are bound to build excitement in anticipation of the meal ahead. As it is time to be seated, we walk amongst the dining room’s white tablecloths, each adorned with flowers picked fresh off the farm. A brick hearth also compliments the warm wooden hues throughout the restaurant. Cloudland lumber accounts for the majority of the room’s timber, the only exceptions being long wooden beams that were harvested from Maine. Immersed in the elevated country life, we sit down for a proper farm-to-table dinner. A beautiful basket of sourdough starters begins every meal on the farm. Ira rattles off the names of all three variations: Francine, Lorraine, and Doc White. Francine’s recipe “was given to Cloudland by Alan Graham of Pomfret when the restaurant first opened.” This sourdough was “started” over 100 years ago, and Cloudland’s chefs have been “feeding it” ever since. The second of the rustic breads, Lorraine, was introduced by Jeremy Glover, the chef for the summer of 2014. The final sourdough, Doc White, began right on the farm by Gillen Schofield, last summer’s NECI intern. 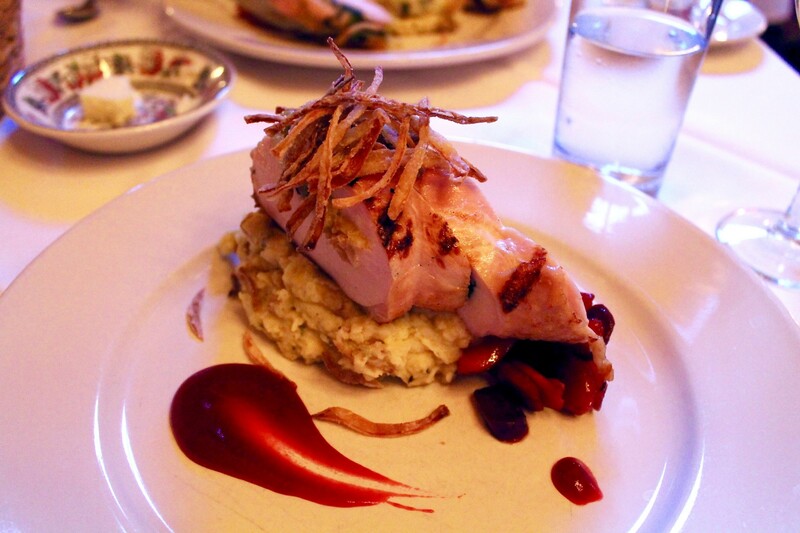 Gillen named this starter after a black and white photo in the restaurant’s hallway, portraying a gentleman named Doc White cutting potatoes on the farm back in 1909. Not even one course in, and we have a rich history of Cloudland Farm right on our table. 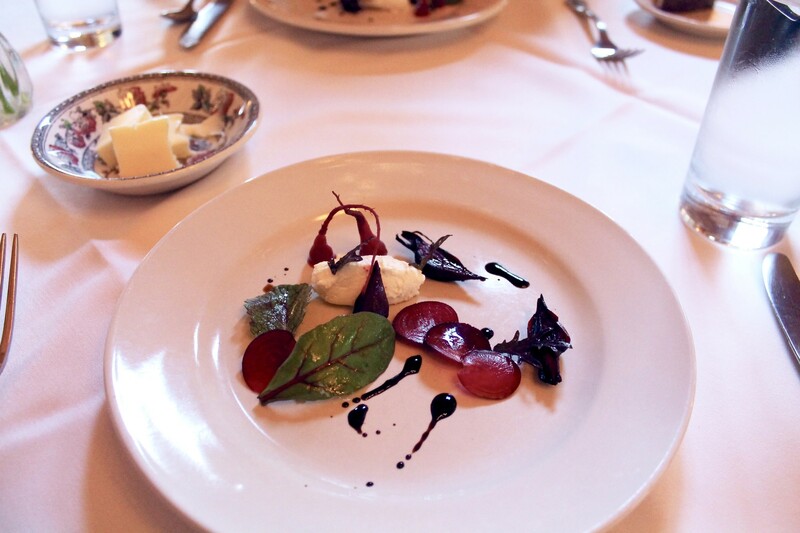 A plate of beets prepared three ways lands in front of us. Goat cheese and balsamic accompany raw beet slices and dark roasted beets. Root ends playfully stand upright on our plate, pickled in apple cider vinegar and thyme. In his search for beet greens, Ira noticed a few came with little beets on the end – the perfect excuse for an exquisite pre-dinner dish. 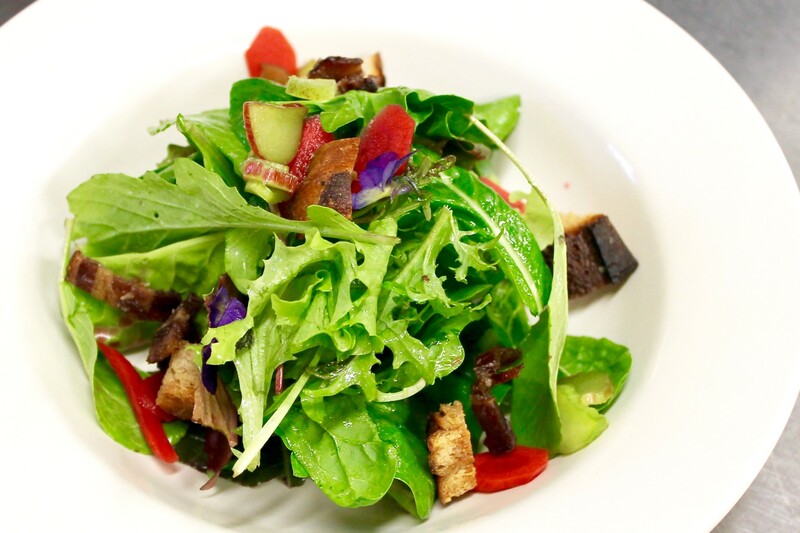 Beets are followed by a spicy mixed green salad with savory carrots pickled in garlic and thyme, macerated rhubarb, candied bacon, herb croutons, and maple mustard vinaigrette. In seasonable fashion, Ira cut and tossed raw rhubarb in sugar before marinating the mix all day. Edible johnny jump ups from the farm’s greenhouse were delicately placed atop the greens to add a pop of color to the mix. For the main course, the chef brined Cloudland Farm turkey with apple cider, junipers, and local Vermont bay leaves from Hildene Farm – a proud find of Ira’s. The turkey was then stuffed with caramelized onions and Tarentaise cheese from Thistle Hill Farm. The ramps we previously foraged were implemented in the grilled ramp mashed potatoes, accompanied by maple glazed carrots, fried onions, and a sweet & sour cranberry gastrique. While the fried onions bring a crunchy texture to the dish, we revel in the sauce that adds a tangy twist to the savory potatoes and protein. The final course, a rhubarb flan tart with vanilla bean, brown sugar streusel, and lemon zest offers a sweet ending to our already satisfying meal. A scoop of marscapone ice cream also calls to mind an elevated orange creamsicle – a tasty foreshadowing of the summer ahead! Strawberry coulis and balsamic gel add an impressive flavor profile to this sweet and final course. We end this meal like all others we’ve experienced at Cloudland – with a large smile and much appreciation. Thank you Bill, Cathy, and Ira for having us once again. We look forward to the warmer months to come, and the evenings to be had lounging on your magnificent porch. 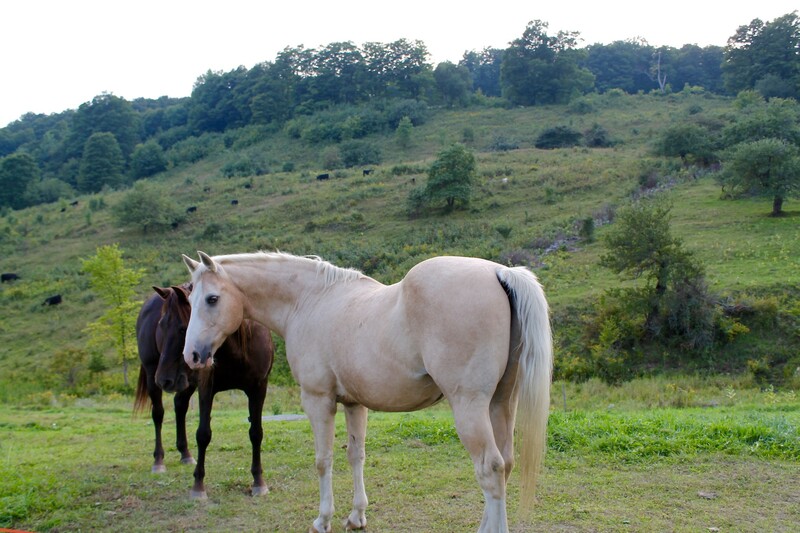 As a reminder: Cloudland Farm is reservation only, Fridays and Saturdays throughout the year. Thursday reservations are also available June 16th through the end of October. The farm is unable to accommodate unexpected guests, especially as calves and piglets are born in the spring. Scheduled tours may be possible if you email Cloudland beforehand!